After hearing about your Minonktalk site, my husband and I have been reading many of your interesting articles. "Just Living in the 40's", "Spencer's Hill" and "Walking Home" are the type of reading we have been enjoying. Keep up the great work! Editor's note: The articles you mentioned were written by Barth Weistart who is becoming the chronicler of Minonk history. We certainly appreciate his contribution to this website. Your addition of the police activities will assist and support the local police in their routine duties ...and as we can readily see much of the work is routine. Your efforts will inform the public of the events that absorb so much of the time of local police. We need to appreciate the efforts of the force and the publicity may well discourage some folks from minor criminal activities. I loved reading the "Just living in the 1940's" - I was born in 1944 - so only hear stories about the ration stamps and the tire and gas shortages. My folks didn't drink coffee, so they traded their coffee stamps with people that didn't need as much sugar - we had such a large family, having a bit of extra sugar was nice! It's funny, I never noticed (as a child!) the barn smell - we raised a cow, chickens, and pigs. What I did notice, when it was my turn to wash the dishes, was when Dad brought the milk bucket in (from milking the cow) sometimes there was yuk! on the bottom of the bucket - it had picked up some of the mixture of manure and straw from the barn floor! I hated washing that off. But cowpies were fun (when they were dried out) - out in the pasture - we could fling them around (that was before frisbies! )or use them for baseball bases! I can still see the rows and rows of shelves of canned food in the basement! We weren't allowed to help ourselves - but once in a while, on a Sunday afternoon, Mom would let us bring up a 2-quart jar of grape juice and we would share it until it was gone! Yum! It was a lot of work, but it was just what you did! For us, it was the appricots that were the most plentiful - we had two trees and we could eat to our hearts content in the summer. Mom canned several bushels of peaches, purchased in Bloomington, and they were just for winter time eating! She made apple jelly from the apple skins left from making applesauce. I think being raised in the country (we only had about 3 acres on the edge of town) was a real priviledge! I would like offer some thoughts on the controversy associated with the trophies of the consolidated school systems, as I think their true, immense value is being missed. Those trophies of yesterday have become today's icons of history that will help the kids of today form a link to those kids of the past that are now their grandparents, parents, aunts, uncles,teachers and leaders of their community. This link quite literally will become part of the anchor of stability that their school and home town will be for the rest of their life. The old trophies and pictures at the Dana Grade School (once the Dana High School) were the first glimpse I can remember of the history I was becoming a part of. I have traveled and lived throughout the world, including living in South America. "Home" has always been and continues to be my home town. While I have not lived in the community for 20 years, I pay Fieldcrest school district property taxes and do significant business locally because of the debt I owe my past. A debt that each of you owe as well. For my niece, nephews and the other kids of today, the merged school is the only thing they will know. Like many other things in life, they will see Fieldcrest through different eyes than their parents. To the parents of today's children and the members of the board, how many know of the regular Sunday afternoon baseball games that were played between the towns in the 1890's? That part of Rutland is actually in the same county and township as much of Toluca? How many know of the train tracks that ran directly between Rutland and Toluca? Many will remember the train between Wenona, Rutland and Minonk, few the Rutland/Toluca line. If one knows how the town histories have been inter-twined from the beginning, one sees the merging of the school districts as a relatively small and natural blip in the history of the area. The alma mater at the University of Illinois is presented: "To the students of today from those that came before". Something I did not "get" when I attended the university. But years later, standing in front of it, I feel the pull and understand the wisdom of those that came before. I would like to propose to the superintendent and board of education, that we show this same wisdom and provide an anchor to our students of tomorrow. I would propose that we create a "History Case" at each of the schools within the district. Showing not just the trophies but other pieces of our local history. I assure you, it will be the most valuable gift of education of all to those students of tomorrow. A lesson, few will immediately understand but that all will "get" as they have reached the year of their 20th class re-union where I now stand. Enjoyed your article about nicknames. One fellow who chose his own nickname was Tommy Toler who was the leader of the pack at good old St Pat's. Before he was El Gato he was Albino from a horse in one of the Thunderhead/Flicka movies. My nickname of Cobby Joe was bestowed on me by Don Ketchmark at St Pat's play ground one day because he thought I ran like I had a cob **********. Maybe other folks might want to give the history of their nicknames. 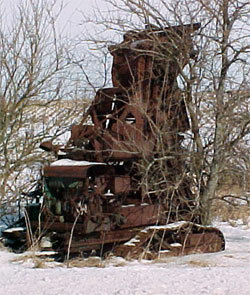 I think the old machine along the road by Cazenovia is an old tilling machine. Wants copy of "Tales from the Trees"
I recently found your website and was delighted! What a great insight into Minonk. My father is Jerome Ingerski and I remember so well his stories of Minonk in the 20s and 30s. Seeing the old A&P, Jumbo, and Princess Sweet Shop made it all come to life for me. I have printed out many, many pages to "snail mail" him. He will love seeing and reading your wonderful site! I am sure he will be able to identify some of the people in the photos that you're asking about, too. I would like to buy him (and his only surviving brother, Walter) a copy of the book, Tales From the Trees by Ailene Hayes Schneider. Do you know how I can get two copies? Editor's note: It is my understanding that the book "Tales From the Trees" is out of print and can only be checked out from the Filger Library. I wish someone could contact Mrs. Schneider and see if the book can be reprinted. This website has rekindled an interest in the book and I think she could probably sell quite a few books. Hi Dave. I'm still reading minonktalk and want to thank you again for the wonderful job you're doing! It's great to have a place to go read about "home" whenever I want. I'd also like to thank Mr. Weistart for his latest Minonk story...just living in the 40's. The article was well written and VERY interesting, sometimes humerous. I hope his efforts encourage others to tell their stories, as well. I'll be looking forward to them! When I read your recent Editorial regarding "Nicknames" I could only relate to my own husband "Ollie". Francis was his given name. Down through the many years he explained many times how this came about..as I heard down the road from his childhood home was a neighbor Alje Janssen. He visited the family often and aparently Alje was a hardy eater and Ollie was reminded many times when he was at the family table if he did not quit eating so much he would become just like his mentor....Alje Janssen (Alje pronounced Ollie) and so as far as I knew the only ones who ever called him Francis were his mother and Uncle Sam. When he was drafted into the Army in WW2 his name was published in the paper and when people asked who Francis Schneider was, I would say "Well that's Ollie". As I sat writing his obituary for his funeral services I knew exactly how I had to start and it was "The Man Called Ollie". Nothing else seemed to fit. Here are some nicknames of my dad and some of the guys he grew up with. Windy McKay, Hoople Janssen, Tony Janssen, Baldy Kleen, Tub Kleen and Mush Kleen. Editor's note: I believe Hoople Janssen's nickname was based on an old comic strip called "Major Hoople". We probably need to set up a new section just for nicknames on this website. Dave-the boy on the back row third from the left in the 1929 basketball team is my Father,Homer(Bill Parks). We are enjoying the Minonk Talk, especially when in Florida. Thanks for all your work! We check your site periodically and enjoy keeping up on the latest happenings in and around Minonk. Because of Minonk's loss of so many businesses and shops I should think the community would encourage the location of a Dollar Store. We have several in LaCrosse, including our large mall, are well maintained and accepted. They do a great business and allows employment not only to older people but our young people as well who need part time work for academic fees and living expenses while attending school. I hope the council will not close it's doors completely on this issue. Offer Dollar store another option for consideration. We definitely want the store (Dollar General) to come to town! For goodness sakes we can't afford to turn down ANY retail at this point. Hi Dave, I welcome the Dollar store. It will keep me in town more and from having to run to Pontiac. The older I am getting the more I hate to even go that far needlessly. In weighing out the good and the bad of it, I think the good is more. I realize that it seems pretty un-fair to the merchants we now have because it was given free to the chain. I do believe once it gets going it will generate some more business to the other merchants. It would naturally have to...Since we do have 39, especially in the good weather people will come through in traveling and get gas and go to the Dollar store and then look around at some other shops in town. Especially if they look kept up and quaint, peaceful...boutique like. Wondering just how much value to the city of Minonk this type business could generate? Low value items, mostly Made in China, copies of old Made In America items. Who can afford employing people to work there on such low priced items? Who needs more junk items in their collection of things they have already purchased over the years? Let the sun hit the buildings that already exist on Minonk's main street. I recall years ago just how cluttered main street seemed to be with that large Livingston Grain Elevator where it was. Looks good now with some room, for ones eyes, to view the space cleaned of buildings on East Side of Main St.
Dave, in the picture of the 1929 basketball players. The second from the right in the back row, looks like one of Buchmueller boys, I would guess, Alfred or Oscar. Also the middle sitting down looks like a Wylie. I wouldn't put my life on these, but those are my guesses. I really haven't studied it that much. We're enjoying upper 70's these days in Sun City. Keep up the good work.....really enjoy the site. Dave, I was in Minonk a week ago attending Esther Uphoff's funeral. I had hoped to meet you, but perhaps you did not attend. Anyway, I have been following your efforts in support of the westside park, and just wanted to voice my support and encouragement. I spent a lot of my formative years playing in that park and on the band stand. It sure has changed a lot over the years. We lived on a farm near Toluca, I spent most summers with Aunt Gustie (Augusta von Behren) on 4th street. I have so many fond memories of Minonk and especially of the park. I hope you will continue your efforts and sincerely hope the city council will wake up and realize the mistake they are making. It appeared to me that the council was using funds earmarked for the park for other purposes. Not sure how they can get by with doing that, but I doubt that they are doing it legally. Anyway, keep on keepin' on and if I can help in any way, please let me know.